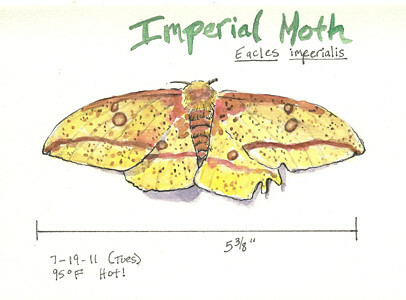 Imperial Moth Watercolor Sketch – Let's Paint Nature! That’s what I said when a co-worker walked into work with this dead beauty in his hands. WOW….it’s HUGE…over 5 inches wide! He found it, already expired, in the grass and because he knows I’m a nut for nature he let me keep it. This imperial moth is really soft. The wings and body feel like suede. You can see individual little hairs on the body. I think this is a female because the images I found for males have larger brown patches on the wings. There may be a puncture wound on its back. Perhaps a bird caught it, dropped it, and then had to leave the scene? Well, I can celebrate its life by painting it in my journal and learning as much as I can about the imperial moth. Here is the photo. You can see the tattered wing and the black on the back is a tiny hole. This big treasure from the sky will live on in watercolors. Wow! You really captured the moth – beautiful painting!! Watching Seasons: (cool name, btw!!) Yes, very wonderful indeed and I was so excited to actually hold it in my hands…what an awesome creature. Alanna: Thank you! such an awesome moth (the real thing, I mean)!!! I just found a LIVE female imperial moth today! She has been very calmly hanging out on my hand, plant, and front of my shirt all morning! I put her in a paper bag to take a break (change clothes, take a shower) and hope that will keep her calm–and maybe even encourage her to lay a few eggs! She’s a beauty–I’ve already taken tons of pix of her. What a cool find. I love when nature gets me excited like that! Thanks! 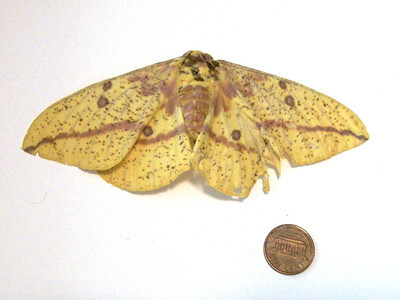 I know that my finding an Imperial moth was a once in a lifetime experience. The moth was beautiful even after she died, but she was more so when she was alive–so I hope you get to find a live one and paint it! However, I love your watercolor–looks very much like “my moth”.